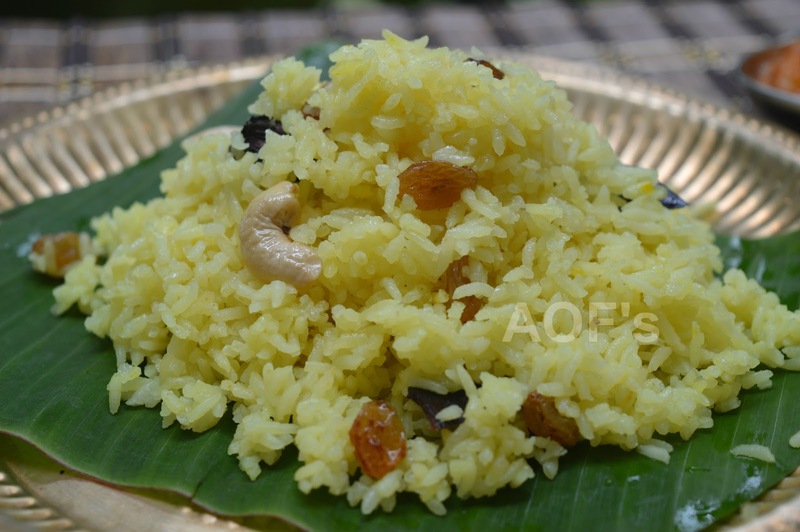 Kanika is a fragrantly sweet pulao that is traditionally prepared in Orissa. It finds a place of pride among the 'chappan bhog' or 56 items that form part of Lord Jagannath's menu. Before the fried rice and biryani became popular in Orissa, it used to be served at all wedding feasts, picnics and family gatherings. It is stronger in flavor than a traditional pulao and also a little sweet. 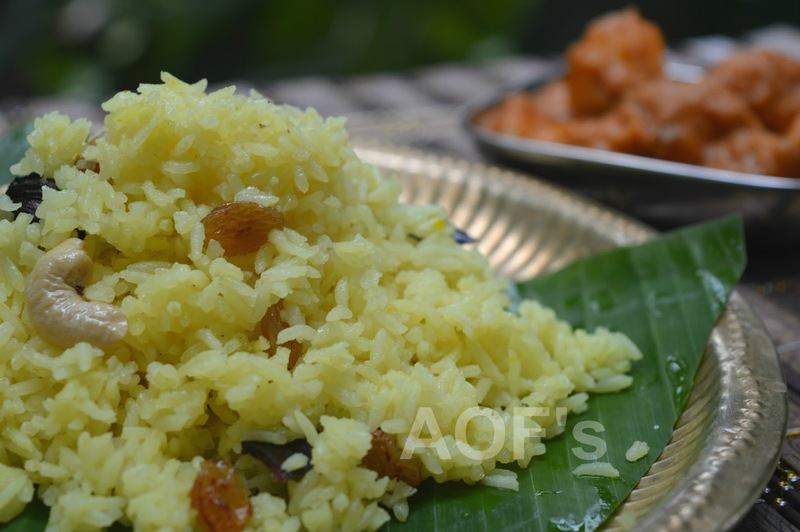 Usually prepared with arua chaula 'raw rice' ( one can find it outside Odisa by the names Ambebhog/GovindBhog ), one can replace it by any other aromatic rice ( Basmati for example ). Though these days it is usually prepared for offering as prasad, I have many a childhood memories of sampling it with some finger-licking mutton/chicken curry. Ingredients - Basmati rice ( 1 cup ), ghee ( 1 1/2 tsp ), raisins ( 10-12 nos), cashews ( 10-12 nos), whole spices ( 1/2 black cardamon( bada aleicha), 1 green cardamon (chotta aliecha), 1/2 inch long cinnamon ( dalchini), 2-3 cloves ( labanga), 1/4 of a mace (jaitri), 1 big bay leaf ( tejapatra) ), 1/6 tsp nutmeg powder, sugar ( 2-4 tsp ), salt to taste, 1/5 tsp turmeric. Preparation - wash and soak rice for 1 hour. Drain all water and spread on a plate. Cooking - Heat the ghee is a deep and thick bottomed vessel. Add the raisins and cashews. Fry till cashews swell up but do not burn them. Remove with slotted spoon and keep aside. Add the whole spices and stir for 20 seconds. Add the dried rice and fry it gently for 3 minutes. Still better if you can gently toss it instead of stirring as with the latter one might end up with broken rice grains. Add enough boiling water ( a little more than two cups in my case ) to cover the rice. Add salt. Allow to cook on a low to medium flame. Allow all the water to dry up. Remove from the flame. Serve with mutton jholo or if vegetarian, go for channa dali-amba khatta.